Planting Cabbages: The Cooking Life: The Garden and Stories at C’est si Bon! The Cooking Life: The Garden and Stories at C’est si Bon! 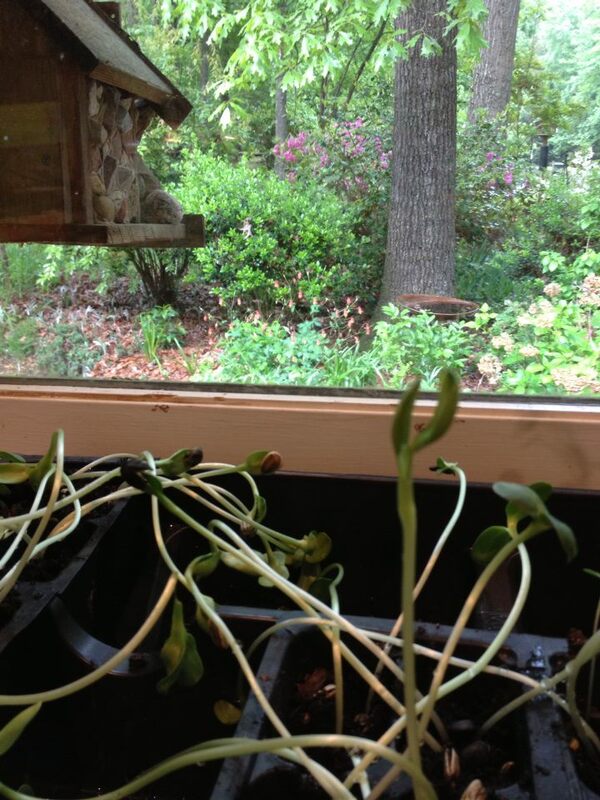 Is gardening like writing and revising? You prepare the soil, throw out some seeds, pray for rain..or sun as the case is now. Muse the muse. When it was still quite cold we took down a white oak tree to let in more sun. Drilled logs and inserted plugs of shitake spores, brushed wax over the holes. As a change to past years, we actually didn't plant a lot of seeds in the garden this spring. Instead, I planted seeds for stories and books. I took a marvelous writing prompt class with Carol Henderson in Chapel Hill. Then I did the unthinkable and went to Hood River, Oregon for a BONI - Break Out Novel Intensive with Donald Maass (who it turns out had a crazy Aunt Sarah who got married in Reading, Pennsylvania) and a host of other cool professionals. I learned from all their critiques (I suspect a conspiracy) that what I thought I had in the story, wasn't there, and that what I have been doing, I should stop. Its part of the process, and there's a LOT of talk that novels should be presented as if a movie, but there is more resonance to have your MC react to what is it that they want, and that they are not getting, and never will. Well, haha. Not if I have any say in the matter. It goes against my grain to have things not work out, the cake fall, the bread get burned, etc.. make a dish unservable. But all that tension is needed when a novel is involved. Good lord with all the tension in my life in the last year you'd think that would be easy. Readers don't read because things are working out, they read to keep hope alive and to see, well, now what is she going to do? How is it all possibly going to work? But when I walked through the garden gate, it turns out the garden has been busy too. I think when you're always busy taking care of things, its both a relief and a disappointment to see life go on without you. But I am getting used to it. And thankful!!! The rhubarb has a huge beautiful flower about to burst, and so I have no idea what to do with the possible rhubarb seeds. Anyone? Black mission and brown turkey fig trees are coming back, our Arkansas black apple tree has gulp, apples, and the thornless blackberries have little green fruits. The green and plain and bronze fennel are all bulbing up after what, six years? Marjoram, oregano, onion chives, purple sage, tarragon, horseradish wintered over and looking very strong! Even the arugula planted from Italian seeds from seven years ago has a new plant. We lost the French Sorrel. I've put in the blue and corrola gold potatoes that I brought back from Oregon. And both the garden and the stories are way due for more sun!